Looking for the Wednesday Wandering? Just page back one for a discussion of that controversial topic: fan fiction. Then come and join me and Alan as we examine some of the more exotic settings for Fantasy fiction. JANE: It would be false modestly for me to take this topic – Fantasy based in historical/mythological material – much further without mentioning that I’ve delved into it a bit myself in my novel , The Buried Pyramid. ALAN: I enjoyed The Buried Pyramid a lot. The first half of the novel is a completely traditional ripping yarn. There are mysterious coded messages, and hints of a shadowy evil that pursues the protagonists through the desert sands. You captured the sense of time and place beautifully – I could smell the unwashed bodies and taste the grit. Then in the second half you changed the mood completely. We learn that the Egyptian gods have not gone away. There are plots afoot and sometimes even the gods themselves need help. The protagonists are soon closely involved with the gods and their schemes. The segue from the grittily naturalistic adventure story of the first section to the fantasy story of the last section was handled really smoothly. One false step here could easily have broken the spell of the story. But the joins didn’t show at all. Well done! What made you write the book this way? JANE: I’m not sure. As I’ve said elsewhere, I write Fantasy and Science Fiction because my mind seems to “work” that way. I’ve always liked stories where, rather than exploration debunking the mystic, the mystic is revealed. And, I think, I wanted to write a story in which exploration of the mysteries of ancient Egypt did not revolve around a mummy and a lost love. Research for The Buried Pyramid was a real challenge because, for the historical part of the novel, I needed to be up-to-date on the theories current in the late 1870’s, but for the “fantasy” section I needed to be as accurate as possible to what Egypt might have been like in the days of the pharaohs – and, specifically, in the days of my own fictional pharaoh, Neferankhhotep. ALAN: As long as we’re on the topic of Egypt – they’re not really fantasy per se, but I’ve always enjoyed Elizabeth Peters’ novels about archeologist Amelia Peabody and her husband Emerson who have a fine old time exploring Egyptian ruins. The books are full of references to Egyptological history and myths. I learned a lot from them, as well as having fun with the stories. And one of the novels, The Last Camel Died At Noon, is almost a fantasy story – it plays with the “lost race” theme that Haggard (and Edgar Rice Burroughs) used so well in their books. JANE: I really liked Crocodile on the Sandbank, but I’ve been more mixed about other of the Amelia Peabody novels. They started to seem like parodies of themselves. Also, I must admit, I could not stand the young Rameses, although he got somewhat more tolerable in other books. ALAN: Ah, now there we differ – I found the young Ramses hilarious, literally laugh out loud funny. More than once Robin asked me what I was giggling about so I’d read the dialogue out to her and she usually collapsed into giggles as well. I was very sad when Ramses grew up and stopped being precocious. JANE: To each their own! 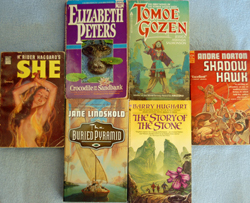 Andre Norton wrote several novels using Egyptian motifs. Shadow Hawk is a straight historical, dealing with Egypt under the Hyksos. I like it a lot. She also did a more contemporary Egyptian novel: Wraiths of Time. ALAN: I don’t want to sound as if I’m riding a hobby horse, but Henry Rider Haggard was also fairly obsessed with Egyptian mythology – indeed his novels were my first introduction to the subject. Wisdom’s Daughter tells the tale of the childhood of Ayesha, She-Who-Must-Be-Obeyed, and in it we learn that she was a priestess of Isis before she came to the caves of Kor. Unfortunately, when she fell in love with Kallikrates, she had to renounce her vows (priestesses are supposed to be celibate) but even so she remained greatly influenced by her upbringing and all four of the novels about Ayesha are full of Egyptian mythological references. JANE: Switching myths and cultures, several Fantasy novelists have used material taken from Chinese and Japanese mythology. Among the Chinese variations, my personal favorites are the three novels by Barry Hughart: Bridge of Birds, Story of the Stone, and Eight Skilled Gentlemen. The first is probably the most indebted to a specific myth, but all of them use mythic elements. ALAN: I’ve read the Hughart books and enjoyed them. Would you consider your own “Breaking The Wall” books to be in this tradition? I’m not familiar enough with Chinese mythology to know how much you and Hughart borrowed and how much (if anything) you made up out of whole cloth. JANE: Not quite in the same tradition because Barry Hughart’s books are set in a China that never was, while mine are rooted in our world – and even the alternate China is firmly rooted in events that are historical to our world. That said, pretty much all my Chinese material is rooted in actual Chinese myth and legend. That “actual” must be taken within context because the Burning of the Books – an historical event central to the novels – meant that a tremendous amount of material was lost and the Chinese have had to rebuild their cultural heritage. I had a great deal of fun building a magical system around a combination of the elements in mah-jong as interpreted through Chinese mythological and cultural material. After a while, it started to have a logic of its own! ALAN: That’s interesting. I didn’t realise that the Burning of the Books was a real historical event. I just looked up the details. It sounds horrid. JANE: You think I’d lie to you? It really happened and it really was horrible! Thinking of other mythic/historical traditions that have been used in Fantasy fiction, I’ve enjoyed several novels using Japanese material. Jessica Amanda Salmonson’s novels about Tomoe Gozen are set in Naipon, an alternate Japan, and use both the culture and feudal historical setting very nicely. I also enjoyed Kij Johnson’s Fox Woman quite a bit, although I felt that Fudoki, which featured a cat, was a bit of a re-tread. Still, she handled her material with skill and elegance. However, I will admit that these novels involve a bit more of a stretch, since neither the cultures nor their traditional religions are taught in American schools. By contrast – probably because the root cultures had such an influence of “western” civilization – most American readers are familiar with a smattering of Greek, Roman, and Norse mythology. ALAN: I’ve always found fantasy novels that refer to cultures and myths that are outside of the Western mainstream very hard to come to grips with for exactly that reason. A good example of this would be stories that make use of the traditional North American myths – perhaps these are more familiar to American readers, but they are certainly quite outside my own experience. Roger Zelazny, for example, wrote a novel called Eye Of Cat, which depended very much on Navajo culture. However, my unfamiliarity with that culture made it very difficult for me to understand what the characters were doing. I found the story confusing and fairly impenetrable. It remains one of my least favourite of his books for that reason. JANE: Ah… I actually taught Eye of Cat as part of a science fiction course I did years ago. My experiences – and several others related to Zelazny’s work with myth and history – are rich topics that I’d like to save it for next time. This entry was posted on May 16, 2013 at 1:00 am and is filed under Thursday Tangents. You can follow any responses to this entry through the RSS 2.0 feed. You can leave a response, or trackback from your own site. Excellent discussion. Thanks for posting. I too loved Shadow Hawk and The Buried Pyramid. One of my favorite historical fiction writers is Wilbur Smith. His books, River God and Warlock are set in ancient Egypt and are similar to Shadow Hawk, but are much more epic. Kij Johnson’s Fox Woman is incredibly beautiful. I much prefer to have fantastical elements to my historical fiction, but straight up is good too. I’ve been meaning to try Wilbur Smith. I think you two have convinced me. Thanks! Personally, I go with the idea that authors can write whatever they want, so long as they’re willing to deal with whatever criticism follows. There’s a fine line between having fun and being patronizing, and having fun with someone else’s culture can cause issues. I’ve read the Hughart books both in ignorance and after a lot more exposure to Chinese culture. I wouldn’t call them either mocking or patronizing… However, humor is always a dangerous element for a writer. That’s a topic I want to explore with Alan down the road. That’s interesting. The backgrounds of stories like Tomoe Gozen or The Paladin or Devil Wives of Li Fong [which is a delight] have never fazed me. I guess getting started on Witch World and Conan and Thongor & Burroughs by age 10 just trained me to take fantasy as it comes. As long as things make sense in context, I don’t worry about where it comes from. Come to think of it, the more familiar I am with the background, the more likely I am to be bothered by anomalies. Which isn’t always fair, since the ‘error’ is just as likely to be on my part as the writer’s, or to derive from me being familiar with a different rendition than the one they drew on. I’ve always meant to read “The Devil Wives…” My “Must Read” shelf is beginning to creak. Thanks for the reminder! I’ve always said I prefer SF to fantasy (even as fantasy has now become to SF the tail that wags the dog), with standout exceptions — Mark Halprin’s “Winter’s Tale” comes to mind, and of course “The Buried Pyramid.” But, when you dig a bit deeper, much (especially early) SF simply took fantasy settings and plunked them on alien planets and called it SF. Physicists tell us faster-than-light is fantasy, which moves a lot of my beloved SF into the other category. There’s a fine line there. I am also very much an Elizabeth Peters (Barbara Mertz) fan, and thoroughly enjoy her Amelia Peabody mysteries. I found the young Rameses amusing: perhaps it comes from my wife and I having been somewhat smart-alecky kids, and rearing kids whom inherited the gift naturally. However, one of the two areas of her novels that I dislike is where she brings about a little bit of mysticism in the interactions between Peabody and her dead friend and /reis/. That did not fit the fictional universe her characters inhabited, at least as I saw it. Not that I at all mind a fictional universe that includes a magical/mystical component, if it’s done so that the mystical element ‘fits’ well. For example, /Thirteen Orphans/ is about perfect in that regard: a mystical realm that *fits* the story and fictional universe well. But more often than not, that situation (or technique or trope) comes across to me as contrived: it’s just not to my taste.